Use with cheese fondue or meat fondue. 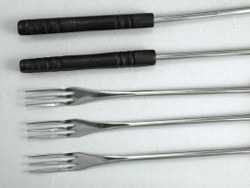 6 - Black ABS plastic 2-tined fondue forks with color coded ends for any fondue type. Great for meat fondue with the color coded ends!